The 17-year-old's Facebook account also appears to have been taken down. Belgian teenager Axelle Despiegelaere became one of the faces of the World Cup, landing herself a modelling contract after being spotted in the crowd in Brazil. Earlier this week, the 17-year-old announced on her Facebook page she had signed with L'Oréal. A video was released to announce the news. After she returned to Belgium she set up a Facebook page, which quickly attracted thousands of likes. That page has now been deleted. 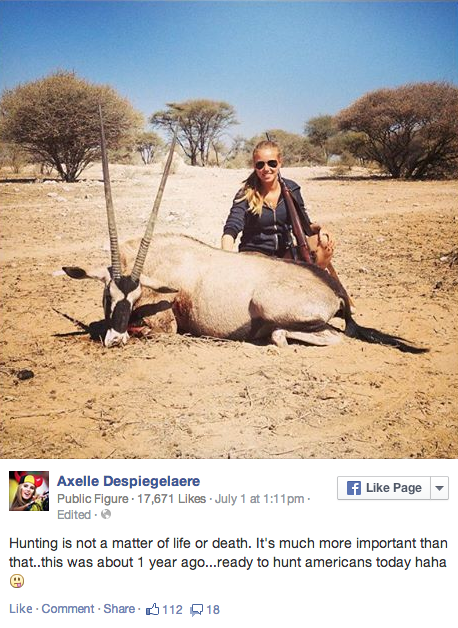 It is claimed Despiegelaere received criticism on the page for this picture, which she allegedly uploaded on 1 July. @Loreal @LOrealParisUSA what do you think of this post by your new model Axelle Despiegelaere? The teenager reportedly added the caption: "Hunting is not a matter of life or death. It's much more important than that..this was about 1 year ago...ready to hunt Americans today haha." The post was apparently uploaded the day Belgium took on the US in the last 16 of the World Cup. Screengrabs appear to show Despiegelaere apologising on Wednesday, saying: "I didn’t mean to offend anyone… It was a joke. Thanks for understanding." By Thursday her Facebook account was down. And now L'Oréal has told BuzzFeed the company is no longer working with the teenager. Axelle de Spiegelaere is not one of L'Oréal Professionnel's spokespeople. L'Oréal Professionnel Belgium collaborated with her on an ad hoc basis to produce a video for social media use in Belgium. This has now been produced. The 17-year-old does not appear to have commented on the controversy or rejoined Facebook, although a fan page still exists.